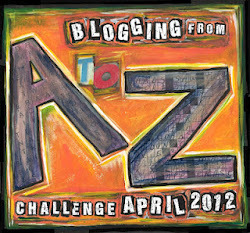 A few times I've seen blogfests and other challenges around the blog and I've been quite tempted to join but, apart from the 80k in 80 days challenge, I always end up thinking 'I haven't been blogging long enough, I don't have anything interesting to say' so I let these things pass me by and watch (or read), from the sidelines, wishing I'd been brave enough to join in. Well, what better way to get over those worries than by jumping into what looks like being one of the biggest events of its kind in our community? Rachael Harrie from Rach writes... is running her third Writers' Platform-Building Campaign. From what I've read about it, it sounds like great fun and a lovely way to meet new people. I don't know much about it but lots of people who have been involved previously sound excited to do it again and there will be challenges. Challenges sound interesting, as long as I don't have to eat live bugs or something. Sign ups began yesterday and close on the 31st August. 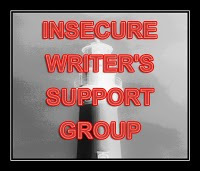 I've signed up to the YA and the Adult Fiction groups. (You can say I'm hedging my bets, I say I'm unpublished and versatile!). I've also signed up to the beginner blogger group. The campaign runs until 31st October, by which time I'll either have met a ton of new people or retired to a darkened room with a bottle of Tequila. So, win-win. Also, my blog gets a shiny new badge. Hello by the way, to the people who were more organised than me and have already come over to introduce themselves. Get the kettle on, I'll be right over. Thank you again to those who took the time to answer my questions last week. I've decided to continue to respond to comments on my blog but also to email those that I can. I was really pleased by how many people come back to read the comments, it's more than I thought. If there is anyone who would be annoyed by receiving an email response, please let me know and I'll make sure you don't get one. I've also decided that I'll be brave, and if I want to interview someone I'll just ask them. The worst they can say is no. It will only be occasional and only if I think I have something interesting to ask. Hi! I joined the beginning blogger group too since I literally just started mine last week. This is my first write campaign also. Hopefully, it won't be too overwhelming for us! Fellow crusader and new follower stopping over to say hi! Hello fellow Campaigner. I totally know what you mean about being brave enough to interview someone - it's an idea I struggle with, too, the idea of asking a complete stranger if I can pester them for information about their job/life etc. for the purposes of making a story authentic. I'm not quite there yet, but I am going to work on wo-manning up and asking! Hi! Stopping by to introduce myself as a fellow crusader and new follower! Hi! I'm a fellow campaigner in your YA group. Nice to meet you! No live bugs? I'm totally there! The title of your blog today made me instantly thing about this. I will have to check out these campaigns as well. Sarah - Thanks for letting me know about those campaigns. Good on you to join up, and I'll be interested to see how it goes :-). And yeah, even if the campaign doesn't work out the way you hope, there's always the tequila ;-). The Campaign idea sounds great but rather complicated, I tried to understand what is behind it, but wasn't really getting it! Anyway it's important that you start something fascinating, I can understand it since I also attend several blogging groups! Hi Sarah, nice to meet you. ope to get to know you better during the campaign. I'm excited for this Campaign! :) It sounds like it's going to be a lot of fun. I could use a little platform building, after the awesome stuff we learned from WriteOnCon. And Rachael is amazing. Thanks for mentioning this campaign. I'm game (and I'll join the YA group with ya). So fun to have you along for the campaign. Thanks for corresponding with me via email. I saw your name on the campaign list! I joined YA too, but I don't think we are in the same group. Anyway, good to see a familiar face. It sounds like it is the first time for both us. Good luck! Thanks for stopping by my blog earlier. I look forward to knowing you as soon as the crazy Campaign storm settles down a bit. Good for you for stepping up and trying something new and especially with conducting interviews. I've had pretty good luck getting authors responding to my requests - I'm sure you will too. Hi Sarah - just blog-hopping by to say hello to a fellow campaigner. Also, looks like I'm your 98th follower! Hello! 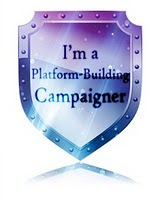 I'm a new campaigner, too! Looking forward to getting to know your brand spanking new blog! I'm looking forward to reading your posts and getting to know you better. Jump in with both feet. You'll do well. It's been a while since I've had tequila. They say I had a wonderful time while I was standing. Great to meet you fellow campaigner! Nice to meet you, campaigner! We are in the same YA group. I look forward to reading your blog! I'm new to the blogging world too! I look forward to figuring it out together in the YA campaign. By the way, your personality really shines through in your writing! Came here from the Platform Building Campaign!! Trisha - Thanks for visiting, hope you enjoy the blog! Mary - Hello Mary, good to meet you! Rachel - Thank you so much for the visit. Wordyliving - You're on! It's fun, isn't it? Claudia - I think it's mainly a way to meet other bloggers that you might not know. That's what I've done, anyway. Mood - Thank you, and ditto! Missi - I saw your group. You've got some lovely people there. You're in for a treat if you're not already following them. Liz - You too, and thank you! Angelina - You're welcome. I bet people say this to you all the time, but I love your hat. Julie - Thanks. I hope you enjoy iy. tfwalsh - Hello to you too, and thank you. Life 101 - Snort! I have no answer to that! Sommer Leigh - Thank you for visiting - enjoy! Casey - That's a lovely thing to say. Thank you so much. AllMyPosts - Welcome, and thank you! Alberta - I'm hoping to visit everyone else too - eventually. I'm looking forward to meeting new victims - I mean subjects - for interviews when the campaign is over. What a brilliant idea! Thanks for sharing the details about this. I I think most people would love to be interviewed! Go for it. Hi Sarah, I'm a new follower and fellow campaigner in the new bloggers group. Looking forward to getting to know you throughout the campaign. Thanks for introducing yourself! I am looking forward to being in the campaign with you. And I love the title of your blog! I can't wait to get to know you as a writer. I've never done it, BUT it's always fun for me to track her pics all over the writing blogosphere. Don't forget the third option - a ton of new people together in a darkened room...with a bottle of Tequila for everyone. [g] Now _that's_ interactive blogging. Thanks for stopping by my blog and commenting, Sarah. I'm sure we'll both have a lot of fun with the Campaign. Don't sweat the interviews. Think of it as making an offer, not a request. You are offering the other person the opportunity to share their ideas and message with you and your followers. That is a privilege, not an imposition. I'm glad there are a few familiar faces doing the Campaign so I don't feel too overwhelmed. I'm trying it out too! Don't know what to expect but we shall see! Fellow campaigner and new follower stopping by. Have a great week! It's a great idea. I think if you ask anyone they will agree. Rebecca - You're welcome. I hope you decide to join in. Talli - Hmm...who do I know who has a book out soon..? Don't worry, I'm kidding. I won't be trying anything new until after the campaign! Jolene - I love to see people I know popping up in new places! Ruth - We never know until we try! Melodie - *Waves back* hi! Swam all the way across the pond with my hot pink water wings to say hi and deliver your honorary pair. Enjoy! Some familiar faces here already. Fellow Campaigner dropping in to say Hello! Hey, Sarah! Just wanted you to know that you are eligible for the giveaway. The last giveaway I had I sent a book to the UK and Spain. Welcome to the Campaign. Thanks for stopping by my website. I'm also extremely jealous that you live in the UK. Hi! Its nice to meet you too! Thanks for checking out my blog! I look forward to learning with you. Thanks, Sarah, for this link! I am going to check it out right now. And thanks so much for your comments on my blog! It's always great to see you! T.B. McKenzie - I'm starting to get to know everyone! Alynza - Hello there, thanks for visiting. David - Aww, thank you. Can you consider my comment my entry? Michelle - Hello to you, and you're very welcome. Hi this is my first time taking part in Rachael's Campaign. Hope to get to know you better soon. Re responding to comments, I often wonder if anyone pops back to read my responses. Nice to meet you fellow Campaigner. Hi Sarah! Just makin' the rounds. You and I are in the same beginner bloggers group!